Before I got off trail this year, a number of people asked me if I was planning on doing a live presentation about my Pacific Crest Trail hike when I got home in Seattle. For those of you who asked, the answer is now “Yes!” On Sunday, January 13th, from 7 to 8:30PM, I’ll be hosting my first ever workshop on how I hiked the PCT at the Athleta University Village store, here in Seattle. Not only will I be sharing some of my favorite stories from the PCT, but I’ll also be providing tips on how to plan your next adventure, whether it be a thru-hike, section hike or day hike. 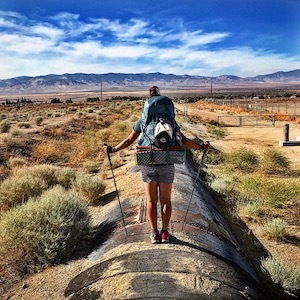 I’ll give tips on what to pack, what to leave at home, how I prepared for my own hike in 2018 and how I’m preparing for my upcoming PCT hike in 2019. I’ll also be sharing my favorite planning resources. And to make things extra fun, I’ll have goodie bags for the first 20 attendees who show up at the event. There will also be a cash raffle at the event with a ton of prizes up for grabs, including a ladies Osprey pack, Darn Tough socks, variety packs of my favorite Energy Chews from ProBar and even a prize from Beecher’s Cheese. Yes, cheese! I love cheese, especially on trail. A HUGE thank you to all of these brands who have donated prizes for the raffle and goodies for the goodie bags for this event. All the proceeds from the raffle will be donated to the Pacific Crest Trail Association. Also, a HUGE thank you to Athleta University Village for providing the space and support for me to host this event. This has been a big dream of mine, talking about my PCT hike in a public space and these ladies helped make my dream come true. All of the ladies at Athleta University Village rock! At the end of November, I was invited to come into a local high school to talk about hiking the PCT. Nothing prepares you for a presenting a live workshop for a bunch of adults like having to talk to a class full of high school students! I shared with four different classes what life was like on the PCT. I brought in my pack and showed the students the gear I used and how I packed my pack. I also showed them photos and videos of some of my favorite sections on trail. I talked about my hardest days out there. I shared with them my biggest fears on trail and how I overcame them. I also went over how I journaled every single night on trail and blogged about my journey with limited internet connection. I loved sharing my PCT experience with the students and getting my public speaking wiggles out before the big event in January. My PCT workshop at the Seattle Athleta University store in January is a free event and open to anyone who RSVPs. If you’re in the Seattle area (or will be), click now to reserve your spot. I can’t wait to meet you all in person and talk about the thru-hike that ruined my life forever.